January 21, 2019; Written By: GreenMedInfo Research Group; Asthma affects about 300 million people worldwide. It is growing by 50 percent every decade and causes upwards of 180,000 deaths per year. The cause is not well-understood but here are 8 proven ways to help relieve symptoms naturally. No single cause of asthma has been identified. Symptoms may be triggered or worsened by viral infections, allergens, tobacco smoke, exercise and stress, among other things. Obesity is also linked to asthma. A study from the Harvard School of Public Health found that obesity is both a risk factor for asthma and is associated with increased severity of the symptoms. And a study in the journal Allergy looked at data from the 2005-2006 National Health and Nutrition Examination Survey (NHANES). It found that obese people had more than 2.5 times the risk of developing asthma as people with a normal body mass index (BMI). Researchers from Duke University also reviewed NHANES data from 2001 through 2004. They found that people with a BMI in the obese range were 12 percent more likely to have more severe asthma. They hypothesized that the inflammation induced by obesity may contribute to worse asthma symptoms. Several studies link some asthma cases to childhood vaccines and their timing. In a study of 1,531 children in Manitoba, Canada, researchers found that the risk of developing asthma by the age of seven was cut in half when the first diphtheria, pertussis, tetanus (DPT) immunization was delayed by more than two months. Delaying all three doses of DPT vaccines cut asthma risk by 60 percent. Studies show breast feeding reduces the risk of developing asthma. In a study of 1500 infants and pre-schoolers, children who were exclusively breast-fed had lower asthma rates than those partially breast-fed or given formula milk. And a meta-analysis of 12 studies published in the Journal of Pediatrics showed that exclusive breast feeding during the first three months after birth reduced asthma risk by 30 percent. Researchers attributed the effect to the immunomodulatory properties of breast milk. For those suffering with the disease, there are natural remedies to relieve symptoms. 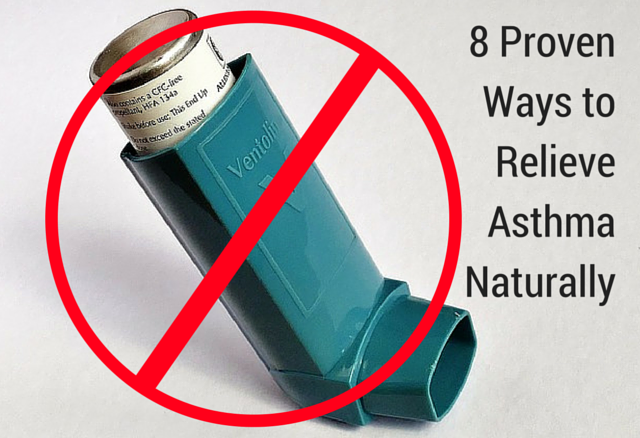 Here are just eight proven ways to relieve asthma. Many studies show that breathing exercises have a therapeutic role in the treatment of asthma. In one randomized controlled trial asthma patients taught breathing exercises showed significant improvements in their quality of life, symptoms, and psychological well-being after six months. In another study, patients were taught breathing exercises known as the Buteyko Breathing Method named after the Russian physician who developed the technique. Buteyko breathing exercises increased asthma control 40 percent to 79 percent and significantly reduced the use of corticosteroid inhalers compared with a control group. In addition, yoga breathing exercises are therapeutic for asthma sufferers. In a study of 60 patients, half were randomized to receive yoga breathing instructions. After two months the yoga group showed a statistically significant improvement in lung function as well as improved quality of life. In another study of 17 university students half the subjects were taught a set of yogic breathing exercises, physical postures, and meditation three times per week. After 16 weeks, data showed that the yoga significantly improved relaxation, led to a more positive attitude, and reduced use of inhalers. The researchers concluded that yoga techniques seem beneficial as an adjunct to the medical management of asthma. In one study 77 patients with mild to moderate bronchial asthma were randomly assigned to two groups. One group received standard asthma treatment while the other group received the standard therapy plus 500 mg per day of curcumin. After 30 days researchers concluded that curcumin significantly helped improve airway obstruction and suggested that curcumin is effective and safe as an add-on therapy for the treatment of bronchial asthma. Researchers from Brown University School of Medicine tested intravenous magnesium on pediatric patients with moderate to severe asthma. Thirty patients were randomly assigned to receive either 40 mg/kg of magnesium sulfate or a saline solution. Just twenty minutes later the magnesium group showed remarkable improvement in short-term lung function. Taking magnesium orally is also effective for asthma control. In a study published in the Journal of Asthma 55 patients were randomly assigned to take 340 mg (170 mg twice a day) of magnesium or a placebo. After 6.5 months the magnesium group had better bronchial reactivity, and better subjective measures of asthma control and quality of life. In another study from Brazil 37 patients all received inhaled fluticasone (brand name Flonase) twice a day and the asthma drug salbutamol as needed. Half the group also took 300 mg per day of magnesium. After two months bronchial reactivity improved significantly in the magnesium group only. The magnesium group also had fewer instances of worsening asthma and used less salbutamol compared to the placebo group. Asthma has been linked to lower levels of vitamin D. In a study of 483 asthmatics under 15 years of age and 483 matched controls, researchers found that vitamin D deficiency was more prevalent in asthmatics. A review of vitamin D studies found vitamin D and its deficiency have a number of effects in the body which could affect the development and severity of asthma. Researchers concluded that vitamin D may improve lung function and response to steroids, and reduce airway remodeling. And in a double blind, randomized, comparative study, 140 patients received standard treatment for asthma while half also received 1000 mg per day of vitamin D3. After six months researchers found that the vitamin D3 significantly improved the quality of life for severe asthmatics. Many people find their asthma symptoms disappear on a dairy elimination diet. A meta-analysis of data from more than 30 studies in the journal Nutrition Reviews found high intake of fruit and vegetables may reduce the risk of asthma and wheezing in adults and children. Researchers concluded that eating more fruit and vegetables could reduce the risk of asthma in adults and children by 46 percent. Another study found tomatoes particularly powerful. Researchers in Australia had asthmatic adults eat a low antioxidant diet for 10 days. Measures of asthma severity worsened. Then for seven days the patients were randomized to receive either a placebo, tomato extract (45 mg lycopene/day), or tomato juice (45 mg lycopene/day). Patients receiving tomato extract or tomato juice reduced their signs of asthma. The researchers suggested that lycopene-rich supplements should be further investigated as an asthma therapy. And research from Johns Hopkins University found that sulforaphane, or foods rich in sulforaphane like broccoli, may be adjuvant treatments for asthma. Sulforaphane is an antioxidant and anti-inflammatory phytochemical also found in other cruciferous vegetables like Brussels sprouts, cabbage, cauliflower, bok choy, kale, collards, broccoli sprouts, arugula, and watercress. Many studies show that fish oil relieves chronic inflammation like that found in asthma. In one study of 20 asthmatic patients, researchers compared fish oil to montelukast (brand name Singulair). Montelukast is a drug used to prevent the wheezing and shortness of breath caused by asthma. The subjects were randomly assigned to receive either 10 mg of montelukast tablets or 10 fish oil capsules totaling 3.2 g EPA and 2.0 g DHA every day for three weeks. Thereafter all the subjects received both treatments together for another three weeks. Results showed that montelukast and fish oil were equally effective (and fish oil was slightly better) at reducing airway inflammation. Pycnogenol® is a standardized extract of French maritime pine bark with anti-inflammatory properties. Italian researchers compared it to the use of corticosteroid inhalers for relieving asthma symptoms. A total of 76 patients used an inhaler. Half the group also received 50 mg of Pycnogenol morning and evening. After six months 55 percent of the Pycnogenol patients were able to reduce their inhaler use compared to only six percent of the control patients. In addition, none of the Pycnogenol patients had a worsening condition but 18.8 percent of the inhaler-only group deteriorated. Researchers concluded that Pycnogenol was effective for better control of allergic asthma and reduced the need for medication. Also, Pycnogenol is effective to help manage mild-to-moderate childhood asthma. In a randomized, placebo-controlled, double-blind study, 60 subjects, aged 6-18 years old, were given either Pycnogenol or placebo. After three months, the Pyconogenol group had significantly more improvement in lung functions and asthma symptoms. They were also able to reduce or stop their use of rescue inhalers more often than the placebo group. In a double-blind study of 76 asthmatic children, patients received 200 mg daily of vitamin B6 (pyridoxine). After five months researchers found vitamin B6 led to significant improvements in asthma symptoms and reduction in dosage of bronchodilators and cortisone. For additional natural strategies explore GreenMedInfo’s page on asthma. LIPOSOMAL VITAMIN C IS ONE OF THE BEST ANTI-INFLAMMATORY SUPPLEMENTS AVAILABLE, INCLUDING FOR THE RESPIRATORY SYSTEM.